When He saw me passing by, He stopped speaking for a moment and looked kindly upon me. The Listening Jesus is the first limited-edition head of Christ by the artist since a different (1978) rendering sold out many years ago. The more recent print is identical in size (22" by 28") to the earlier rendering, though somewhat different in technique. The Listening Jesus is limited to 1,993 signed and numbered prints and 199 artist proofs. The artist will tint the eyes of your print blue, green or brown (or leave them untinted) —whichever you specify with your order. To see the eyes tinted blue, green and brown, click on the Listening Jesus image. 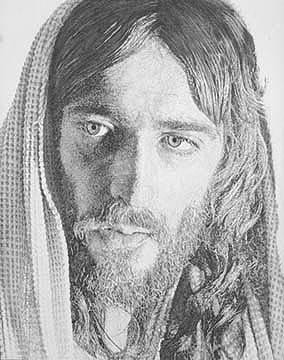 To view a rare copy of the artist's first Jesus of Nazareth pencil study, click on the thumbnail above. The limited edition of 1,000 prints sold out in the early 1980s. But six unsold copies recently (late 2007) were discovered in a former distributor's garage.